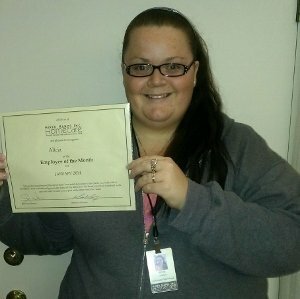 Alicia is Our North Bay Home Care Employee of the Month! Alicia is a Hired Hands Homecare STAR! Alicia has been with Hired Hands Homecare since September 2013,and has recently been working with one of our Live-In Clients. A recent compliment she received from her current client is that “she completes me; if I stumble in a conversation or on word she knows exactly what I am trying to say”. Alicia is very aware and makes sure to note any concerns right away and will even call the office when she is not on shift to check in and make sure her Client is doing well. She deserves this award 10 fold! Alicia….We are so EXCITED to have you on our TEAM! Many Thanks for all you do!